An integrated pest management (IPM) program for cassava pests in Valle del Cauca is being designed and implemented. Because farmers’ surveys show that the predominant pest, for both small and large farmers, is whitefly, emphasis is being given to the complex of whitefly species associated with the crop. At present, research activities for whitefly control, many funded by the Colombian Ministry of Agriculture and Rural Development (MADR), include host-plant resistance, biological control, cultural practices, and chemical control. CIAT and CORPOICA have jointly developed a cassava variety that is resistant to whiteflies. Released in November 2002, this variety is expected to greatly aid small farmers to control this pest. Various biological control agents, including predators, parasites, and entomopathogens have been identified and are being evaluated. An isolate of the entomopathogenic fungus Verticillium lecanii (CIAT 215) has shown highly positive results in preliminary trials, and has the potential to be commercially formulated. A predator species, Chrysopa sp., has been collected from whitefly infested cassava fields, and is being mass reared in the laboratory. It will then be evaluated in the field for whitefly control. Numerous parasitoid species of whiteflies have been identified in field surveys in three countries (Colombia, Ecuador, and Venezuela) but their efficiency in controlling high whitefly outbreaks is still being assessed. A 2-month prohibition on growing cassava at CIAT’s Palmira station dramatically reduced whitefly populations in subsequent plantings. The prohibition is now recommended practice, especially for large-scale cassava farmers in Valle del Cauca. Most farmers, small or large, resort to pesticide applications to control whiteflies. In a series of field trials, Confidor® (imidacloprid) gave the best results for controlling cassava whiteflies, with Actara® (thiamethoxan) also giving favorable results. However, a cost-benefit ratio study shows that, while pesticide use for larger farmers is profitable because of a guaranteed higher price for cassava roots, it may be uneconomical for small farmers. These results reinforce the idea that alternative methods must be sought for whitefly control that are efficient and cost effective for the small farmer, as well as being environmentally sound. 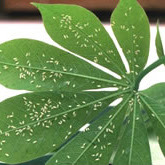 Nataima-31: A cassava variety resistant to whiteflyWhitefly resistance in agricultural crops is generally rare, and control usually requires the continued use of agrochemicals. Pesticide use reduces farmers’ income, and is especially detrimental to small farmers who do not have easy access to credit for purchasing costly inputs. Host-plant resistance (HPR) offers a low-cost, efficient, and easy-to-use technology for controlling major pests in cassava, such as whiteflies. Several good sources of resistance to whiteflies have been identified in cassava, and high-yielding, whitefly resistant, cassava hybrids are being developed. The hybrid CG 489-31 (CIAT breeding code) is officially being released by CORPOICA in November 2002, under the varietal name ‘Nataima-31’, probably the first of a food crop to be released for whitefly resistance. This variety was developed over 15 years in a collaborative effort between CIAT and CORPOICA. Especially for small cassava farmers, ‘Nataima-31’ is a high quality, high-yielding, cassava variety that will require little or no pesticide use. It is also moderately resistant to thrips and mites. In order to try to help "stem the tide", I have just finished re-writing my IPM encyclopedia entitled: THE BEST CONTROL II, that contains over 2,800 safe and far more effective alternatives to pesticide POISONS. This latest copyrighted work is about 1,800 pages in length and is now being updated at my new website at http://www.stephentvedten.com/ . This new website at http://www.stephentvedten.com/ has been basically updated; all we have left to update is Chapter 39 and to renumber the pages. All of these copyrighted items are free for you to read and/or download. There is simply no need to POISON yourself or your family or to have any pest problems.